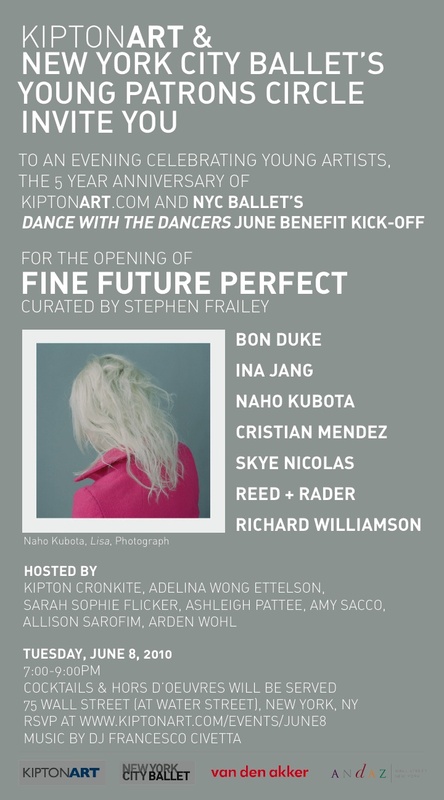 On June 8th in the heart of the financial district, KiptonART + New York City Ballet's Young Patrons Circle will be celebrating young artists, the 5 anniversary of KiptonART.com and the NYC Ballet's 'Dance With The Dancers' June Benefit Kick-Off for the opening "Fine Future Perfect." The evening will be hosted by Kipton Cronkite, Adelina Wong Ettelson, Sarah Sophie Flicker, Ashleigh Pattee, Amy Sacco, Allison Sarofim and Arden Wohl. DJ Francesco Civetta will be providing music throughout the 2,200 square foot ground floor retail space at 75 Wall street for the launch of the newest KiptonART "Access" space curated by Stephen Frailey.